A fun Read but not the best of Butcher’s writing. Not the best of Jim Butchers writing, but you will need to read the book to get to the better books later in the series. His is a great books, well written and a great story, but nearly every page has a typo of some sort on it. Was the book never even edited? This book succeeds on every level as an epic fantasy. It's action packed, yet has a good amount of and diverse characterization. It succeeds in blending elements of humor, sexuality, love, villainy, depravity, heroism, violence, magic etc. that one expects from fantasy. There really isn't anything bad to say about this book in my opinion. If you're a fantasy buff like me, who might not worship or are bored with the seemingly endless influx of grim/dark tales, this book could be a welcome respite. A+! Seriously, this whole series is really amazing. Starts a little slow so stick it out, it is really good. I am an avid reader of urban fantasy (vampire, wizards, etc.) and coming of age fantasy fiction. When I came across the Harry Dresden series, I thought that it was amazing. It was creative, action-packed, passionate, and funny storytelling at Its best. Jim Butcher built his characters so solidly and vividly that you knew them like your best friend or family member and yet each book was surprising with unexpected plot twists. While reading the Dresden books, I thought that Jim Butcher could not write a better series. Scattered amongst the Dresden series were the author's description of a new series of fantasy books that he is writing. Well, it took several months for me to read all 15 of his Dresden books. I finally have the time to start reading his Calderon series. I have only read the first book of the series and already know that I will not be able to stop until I have read all of them. Without giving away the story, the figuring out of which is part of the pleasure of reading Jim Butcher, this is a heartwarming story of a young boy who possesses no magic in a world filled with people who can wield powerful magic. The magic is unusual and imaginative. The fantastic creatures and landscapes are remarkably real and detailed. But, best of all, the people are quirky and human. Even the villains have depth and feelings. The story has romance, courage, heroism, cowardice, terror, and love. The tension builds quickly within the first few pages and never lets down until the end. I'm not quite sure why, but it's more expensive to buy the book on here than it is to purchase the book from a book store. I got my copy at Books-A-Million and it was only $7.99. This is an ok read, but starts out incredibly slow and doesn't really pick up till the end. I found the characters and events to simply not be interesting. Until the end. And really it was only the action that made it good. Which is disappointing, this should feel like a better book than it is. Maybe the series as a whole is good, but the initial starting starts out poorly. I simply had trouble liking/caring for the characters and as far as character development goes, there is almost none. Except for Amara, one of the main characters of this book. But even this is limited. I don't know, it's hard to describe what makes this book so-so. I think it has to do with the furies not being explained. For the fact that you are simply thrown into the events with little explanation. That the characters are easy to figure out. The upside is the action. It is really well explained and each detail of the battle is well done and you get a sense from the pages just what exactly is going on. And overall, it is not a bad book, it just isn't all that interesting. I am being too harsh though, it gives you a fairly rich and epic universe to sink your teeth into and there are a few good character moments. It would have helped if it was less predictable though. Is this book worth it? 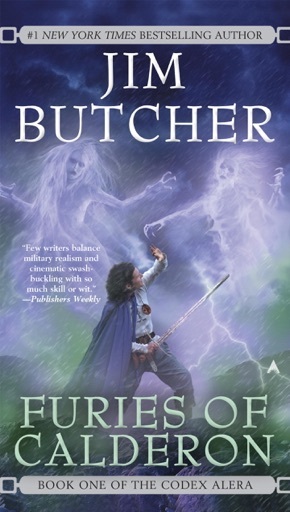 Jim Butcher is a quality writer and this is certainly nothing bad and maybe the series has some value, but this first in the series is overall boring. The plot is predictable, the characters are easy to figure out and there are few surprises. However, if you like good action and an epic landscape with some political intrigue, this might be the book for you. I really enjoyed this book! Even the battles were described in interesting detail. I look forward into diving into the second book. I highly recommend this book!